I live with someone who loves Woody Allen movies. I’ve seen (almost) all of them. We own at least 10 of them. At once point we had two copies of Annie Hall. So when we went into the theatre to catch a viewing of Woody Allen’s 41st (!!) film – I settled in for some jazz & witty banter. I wasn’t led astray. This had all the telltale signs of a Woody Allen movie but I felt like it was easily accessible for anyone to immerse themselves in. I loved Owen Wilson’s character as he interacted with his literary & artistic icons. I loved the icons themselves. Dali! Picasso! Stein! It made me want to go do some heavy re-reading of their work. The Parisian scenes caught my imagination even though I once visited there for 3 weeks straight. The man we overheard in the lobby pre-viewing was right – this movie will make you want to save up for a trip to Paris – no doubt about it. I identified with the themes of wanderlust & belonging as well as the concept of ‘living in the present’. I wouldn’t mind re-watching this one. 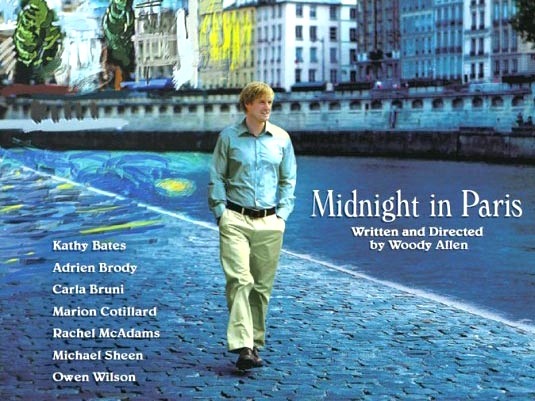 Just saw this movie yesterday and can’t stop thinking about Paris too! And how Adrian Brody still looks hot, as a surrealist with a crazy waxed moustache.